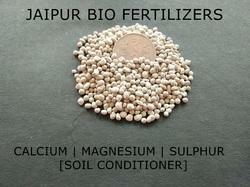 Soil Conditioner Granule (Ca:Mg:S) is made of gypsum. Gypsum is calcium sulfate a naturally occurring mineral which is mined from the ground. Chemically it is about 22 -23% available calcium and 15 - 20% sulfur and other compounds. Soil Conditioner Granule (Ca:Mg:S) is made of gypsum. Gypsum is calcium sulfate, a naturally occurring mineral which is mined from the ground. Chemically it is about 22 -23% available calcium and 15 - 20% sulfur and other compounds. It is utilized for cell division formating. It helps in nitrogen metabolism. It reduces the respiration rate. It influences the microbial activity. It is a activator and component of many plant enzymes. It is a key element of chlorophyll production. It helps in the utilization and mobility of phosphorous. It increases the iron utilization in crop plants. It helps in the uniform maturity of crops. It is the integral part of amino acids. It promotes the nodules formation in legume crops. It is partially involved in chlorophyll formation. 1.Calcium is a vital nutrient needed by all plants to remain healthy and strong. 2.Sulfur is also needed by plants. Sulfur increases protein in grass, grain and foliage. Sulfur also decreases excessive levels of magnesium and sodium in the soil. One pound of sulfur is required for every 10 to 15 pounds of nitrogen used by plants. Plants use sulfur in the sulfate form. 3.Good soil structure is one of the most fundamental ingredients necessary to produce vibrant, healthy plants and lush velvety lawns. The use of Bio Gypsum Soil Conditioner is one of the surest ways of insuring good soil structure. Bio is a natural soil conditioner that aids plant and lawn growth by loosening heavy, dense and water impervious clay soils. 4.Loosens the soil, making it open and porous, water and other nutrients are able to penetrate deeper into the soil, quickly reaching the root systems. Fertilizers are more effective because they can migrate into the loosened soil quickly and can be utilized immediately because of the sulfur present in Bio. Strong, vital root systems can develop in the loosened soil, enabling the plants to reach moisture and other nutrients. It can be used as basic fertilizer, additional fertilizer and seed manure. It is suitable especially for onions, garlic, hemp, potatoes and other crops which need high sulfur but avoid chlorine. 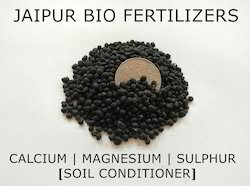 Looking for Calcium Magnesium Sulphur Soil Conditioner ?